There is an interesting juxtaposition to seeing camels on the beach isn’t there? In my mind, camels are meant to be kept in the desert, miles from the ocean. However, the truth is, that more often than not in North Africa the desert gives way to the ocean and you find these great creatures along the sea as well. I love camels, they make me happy, there is something about their goofy faces and their awkward waltz that entertains me to no end. So as I walked down the beach in Essaouira, Morocco I knew that if I could only take one photo, it was to be of the camels along the beach. 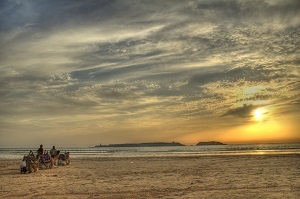 I managed to set this photo up along with the beautiful Moroccan sunset as well which was a great bonus. Obviously there is some serious post-processing done to this photograph. However, for me the beauty of this photo isn’t in the processing but in the composition. So often we hear of the rule of two-thirds in photography. We almost become photography slaves to that rule. However, in certain situations, breaking that rule can create a much more dramatic effect. I chose to use a 1-fifth composition here because I wanted to play with the lines of the sky. I also wanted to make it seem as if the camels themselves were enjoying the sunset. OMG, absolutely stunning! Sunsets are my fave shooting object!